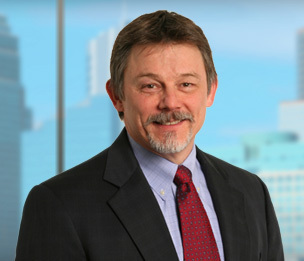 Reed R. Heimbecher is the Leader of Dykema's Intellectual Property Transactional Practice Group and the Office Managing Member of Dykema's Minneapolis office. He has over 25 years of experience in all aspects of worldwide IP law. His practice currently focuses on patent and trademark prosecution and portfolio management, client counseling, and intellectual property due diligence. He also provides all types of opinions, including patentability, enforceability, availability, noninfringement, and invalidity. Mr. Heimbecher also does agreement work, and he handles appeals before the Patent Trial and Appeal Board as well as in federal court. Prior to joining Dykema, Mr. Heimbecher managed his own firm, which St. Jude Medical (a Fortune 500 company now part of Abbott Laboratories) selected in 2012 as a “Go-To Law Firm for Patent Prosecution” (as recognized by American Lawyer Media). Mr. Heimbecher had previously served for seven years as Vice President, Intellectual Property, and Chief Patent Counsel for St. Jude Medical’s Atrial Fibrillation Division. Before his seven-year tenure with St. Jude Medical and before he managed his own firm, Mr. Heimbecher was a partner in the Intellectual Property practice group of a 700+ attorney, international law firm, and was Patent Practice Group head for that firm's Colorado and Montana offices. Mr. Heimbecher clerked for the Hon. Giles S. Rich of the United States Court of Appeals for the Federal Circuit. Judge Rich was one of the primary drafters of the 1952 Patent Act and was often referred to as the "Dean of Patents." Before attending law school, Mr. Heimbecher worked as an aerospace engineer for a large military contractor, where he carried out performance and aerodynamic analysis, and six-degrees-of-freedom trajectory simulations of Tomahawk cruise missiles and of launch vehicles for putting large payloads into outer space. He held a Department of Defense Secret clearance. Mr. Heimbecher has extensive experience drafting and prosecuting patent applications in the following primary areas: medical devices; designer window coverings; package design and manufacture; Internet and computer software/hardware; business methods; vacuum technology; flight control equipment; sporting equipment; fluid handling systems; automotive mechanical systems; and electronic cigarettes.